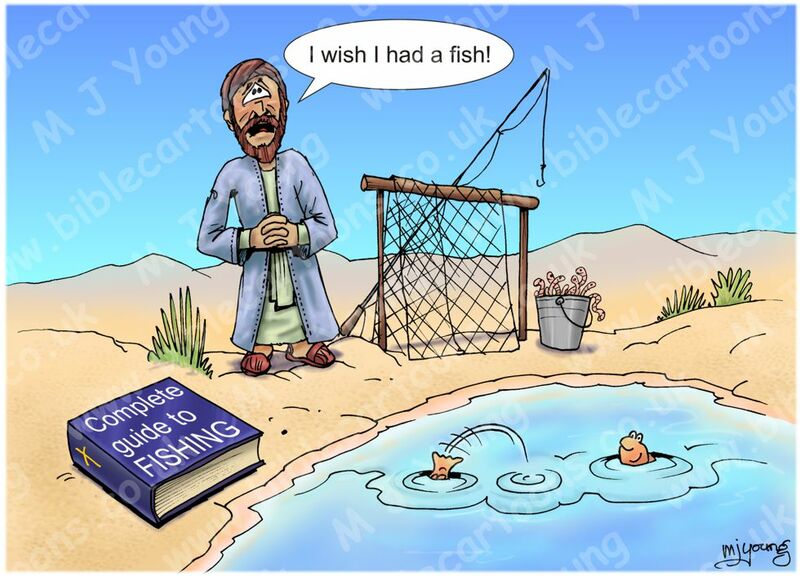 Bible Cartoons: I wish I had a fish! Meta4 Picture: I wish I had a fish! This metaphor came to me when I was blogging about strategy. It would be crazy for someone to have all the equipment, knowledge & time to go fishing, but simply wait passively & expect fish to appear before them! To be successful at fishing we have to do something: cast a net out into the water; use a baited hook on a fishing line, etc. God rewards our diligence & effort, patience & persistence by driving fish into the net or towards the baited hook. Our action, together with God’s action, usually gets results. If we stand on the shore & “wish for fish”, but don’t DO anything, then we’ll be waiting a long time! 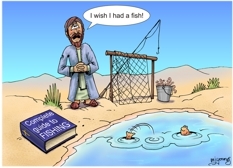 God might cause a fish to jump out of the water into our hands, but that is not very likely! And even if he does that, it will only be to encourage us to get up, get the net & go fishing! It won’t be a long-term Godly feeding strategy for us! I think God expects us to DO something to help ourselves; some ACTION which God wants to bless with success. If we remain passive & do nothing, then there is little God can “work with” in our lives! We can help ourselves by DOING something: getting a net, learning to fish with it, & throwing it into the water. Of course it not wrong to pray for something to happen. At the moment of pray, we are to be still before the Lord, but that is not to say that prayer is passive, far from it. Prayer is probably one of the most “active” things we can do, to effect positive change in life & this world. But AFTER we have prayed & brought our requests before the Lord, it may well be time to get up & DO SOMETHING, which He can then bless. We need to recognise that WE have a part to play in our own success. It’s not up to the Lord to throw fish at us from the water! He wants to bless us, but that can only really happen if we GO FISHING! Sermon/teaching theme suggestions: This picture could be used to talk about the combined actions of prayer, coupled with activity, following that prayer. It could be used to show that prayer without activity on our part may not be what is required by God to effect change in our lives. This picture could help people to see the connection between prayer & activity. Very good & helpful “Word for Today” article from UCB – see below. Well worth a read if you struggle with making your dreams become a reality. This really got me thinking about my own strategic planning: spelled A-C-T-I-O-N PLANS! Oh, & sorry to all my American friends for the study referred to, it’s nothing personal, honest! King David came up with a plan for building the temple, but his son Solomon actually built it. Question: Do you have a strategy for fulfilling your dream? Are you working on it? Or are you waiting for someone like a fairy godmother to come along and bail you out? The only thing worse than having no dream is having one without a plan to make it a reality. A strategy gives you energy, direction and focus. A study was conducted on how infrequently people develop strategies for achieving their dreams. Here’s what it revealed: 26% focus on specific, tangible targets for what they want in life; 19% set goals aligned with their purpose, mission, and passion; 15% write down their goals in specific measurable detail; 12% maintain a clearly defined goal for every major interest and life role; 12% identify related daily, weekly and long-term goals with deadlines. Only 7% take daily action toward the attainment of at least one goal. Here’s a comment from the study’s authors: ‘Americans, once again, get an ‘F’ in this critical area of their performance. Simply put, they fail to consistently take the actions necessary to move their dreams and visions out of their hearts and heads and into their lives’. Dreams don’t come true because you ‘wish upon a star’. They come true because you seek God for direction, put them down on paper with specific actions and timelines, become accountable to yourself—and if you’re wise, to somebody else too. So the word for you today is, ‘Stop stargazing and start strategising’. [I’ve added CAPITALS, bold & italics to a copy of the article below, to add emphasis to the parts that really struck me & to which I want to draw your attention. My personal comments & observations are in [ ] square brackets]. King David came up with a plan for building the temple, but his son Solomon actually built it. Question: Do you have a strategy for fulfilling your dream? Or are you waiting for someone like a fairy godmother to come along and bail you out? The only thing worse than having no dream is having one without a plan to make it a reality. [Personally I have often avoided making definite, measurable, time scaled plans, because if/when I don’t achieve them, I get sad! That’s avoidance of my own disappointment. Most often the sadness comes if/when I don’t complete the action(s) in the prescribed time frame which I have set. Perhaps the timescale was too ambitious? Even so, SETTING a timescale is good practice, & means I INCREASE the likelihood of achieving the goal, rather than having no plan/timescale, which definitely decreases my chances of achieving goals! So the practice of setting goals (creating a strategy) is a good one. To avoid the feared disappointment, I merely need to adjust the planned finishing date, especially as I go along inside the plan, adjusting it as new information comes in. An ambitious timescale helps to motivate, but it shouldn’t be allowed to depress me! 01) Energy is created by a strategic plan because it FOCUSES our minds on achievement; on what it will be like to achieve the goal: how that will make us feel like “winners”! Energy is also created by having a definite goal, & making deliberate actions (like steps along a pathway) which we can then see ourselves approaching, doing, achieving, & passing. This sense of PROGRESS creates energy to achieve MORE progress in the future. 02) Direction. Having no goal, & no plan to achieve that goal, leads to fuzzy thinking, allowing distractions to take hold of our attention, wasting time on frivolous, unnecessary things, meandering though life. Whilst we might not want all of our lives to be time tabled, scheduled & controlled by strategic plans (!!!) we can see that it is useful to have the most important aspects of our lives planned for, in some way(s), so that we maximize our chances of achieving those goals. Success in them is made MORE LIKELY by having direction. 03) Focus. This is a “do/don’t do?” practice. Having a definite goal means excluding ourselves from other (contradictory) goals. We can’t achieve everything that pops into our heads, after all! Some things are just not “meant” for us to achieve. We just don’t have the life-time to achieve all the goals we’d like to! 12% identify related daily, weekly and long-term goals with deadlines. Only 7% take daily action toward the attainment of at least one goal. Here’s a comment from the study’s authors: ‘Americans, once again, get an ‘F’ in this critical area of their performance. Simply put, they fail to consistently take the actions necessary to move their dreams and visions out of their hearts and heads and into their lives’. Dreams don’t come true because you ‘wish upon a star’. 03) [Thereby] become accountable to yourself—and if you’re wise, to somebody else too. [Wishing upon a star is not “wrong”, as HAVING a dream is important. No dream means no goal, after all! The problem comes when ALL we do about our dream is “wishing upon a star”! In other words, we take no action ourselves in moving forward toward that goal. “Wishing upon a star” is the starting point, then the next step is creating a strategic plan to move us ever closer to achieving that goal. Determination, clarity, focus, planning, action, post-action self-assessment, re-alignment of goals in light of our performance, striving, courage, etc, etc are all REQUIRED, if we are to turn the wish into our reality. The question is: How am we going to make this wish into a reality? What are we going to actually DO, to try to achieve this goal? These questions are strategic questions: “doing” questions; they lead to action on our part, in the achievement of the goal. I’ve outlined one problem above: not having any plan at all. At the opposite end of the scale is a danger zone too: don’t get “hung up” on trying to create the perfect strategic plan either. Plans are really possibilities in paper form. They are suggestions of how it might be possible to achieve the goal. We don’t know what will, & what won’t work, until we try it! Don’t get “hung up” on trying something & finding that it doesn’t work as well as we’d hoped. Maybe a step towards the goal will work, maybe it won’t. Either way we LEARN something, & in BOTH cases we figure out what will get us closer to the goal. Thomas Edison learned over 2000 ways how not to make a light bulb work, before he learned how to make it glow! So called “failure” leads to success IF we allow it to teach us something. For the Christian this is vital. We NEED to know that our chosen goal is actually one that God WANTS us to achieve. God’s will is a vital part of what “success” actually is, for the Christian. It’s not that we are afraid to establish a goal on our own, in case God thwarts it! It’s that a goal that is sanctioned by God has his “rubber stamp” on it; then watch as He gives us what we need to achieve the goal! A goal without God’s explicit approval might not be “wrong” (i.e. sinful) but the achievement of that goal may be less exciting, meaningful & above all SATISFYING, than one He had endorsed from the beginning. If we seek God, & get his direction, then we will be more resilient to setbacks & spiritual opposition (sure to get that! ), plus we will be much more satisfied & elated when we finally achieve the goal. 02) Put them down on paper with specific actions and time lines. Write down the goal. Record it somewhere. Then write down HOW we are going to achieve the goal. Write down what ACTION we need to take, to make the goal achievable. Also put these written records in a prominent place, so we can SEE them. It is said that business plans, so carefully crafted but filed away somewhere, are often forgotten & remain un-actioned, because they are “out of sight” & therefore “out of mind”! That’s why our goals, specific actions and time lines MUST be close at hand, or prominently displayed, that way they act to REMIND us of our goals & what we need to DO to achieve them, all the time! It is much easier to quickly assess something coming towards us in light of our written goals, actions & time scales, IF we have them in view: the thing is either an opportunity/asset to help us TOWARDS our goal, or else it is a distraction, deflecting us AWAY FROM our goal. It is MUCH EASIER to assess the thing, if we have our goals, action plans & time scales in view at all times. 03) Become accountable to yourself—and if you’re wise, to somebody else too. With the best will (& motivation) in the world, if our goals & plans are only know by ourselves, then we can gradually go “off beam” & get deflected by subtle distractions which come along; ones we don’t even realise have taken a grip on our minds. Accountability to someone other than ourselves (a spiritual or business mentor) helps us to remain “on target”. They can question us in such a way that they uncover these subtle distractions & help us to “see them” more clearly for what they are. An accountability partner or mentor helps us to remain “true” to our stated goals: something like a conscience! So the word for you today is, ‘Stop stargazing and start strategising’. [Personally, I have been wondering what I should do about bolster Bible Cartoon sales & viewers on the website. There must be something I can do about that. I listened to Katherine Ruonala (Australian preacher) yesterday (03/09/2014) “Dreaming with God” – Friday 22/08/2014. She talked about declaring our goal or vision, as a form of “stepping into it”. Reminding the Lord God of what he has said in the Bible about our success. I lay on the bedroom floor & started to do that! But it’s not a “one-off” to do & forget about. Every day we need to do the same thing: to wrestle with God & to affirm & appropriate the gifts He has given us. “Calling them into being”, from the invisible world of the possible into the visible world of the actual. Not arrogantly or selfishly grabbing, but aligning ourselves with God’s heavenly provision: he wants us to be successful, so we are calling that powerful potential from God in heaven, down here to the earth as a physical manifestation of his favour upon our lives. And we are favoured, because we belong to him: Christ lives within us, so of course Father God wants to bless us. That is the “theoretical” side of the equation! The “material” side of it is what we will actually DO, to help ourselves & to ALIGN OUR ACTIVITY with the will of God, so that our “doing” & our confession of what God wants to do for us, all line up. Doing = plans. Stategic plans. Action plans. Time scales. What will we actually do, in accordance with the will of God, to allow God to bless us? It’s a bit like fishing: we cast a net out into the water, & God drives the fish into the net. Our action together with God’s action gets results. 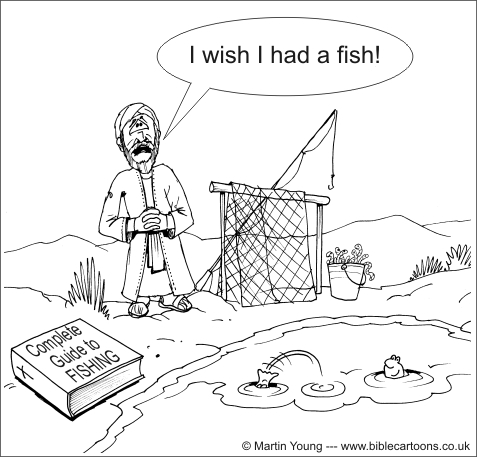 God might cause a fish to jump out of the water into our hands, but that is not very likely! And even if he does that, it will only be to encourage us to get the net & go fishing! It won’t be a long-term Godly feeding strategy for us! I think God expects us to DO something to help ourselves; some ACTION which God wants to bless with success. we can help ourselves by DOING something: getting a net, learning to fish with it, & throwing it into the water. I now have some strategic plans for increasing sales of Bible Cartoons.